Even though there are many, many people who enjoy both traditional and digital scrapbooking, there is still a significant group who believes that most digital creations are more akin to photo books than true scrapbooks. Without getting into a debate over what the word “scrapbook” really means, I feel this is a valid point. Sure you can use almost any image editor to slap a frame and a caption on a digital photo, but is that really a scrapbook page? If you want to create digital keepsakes that more closely resemble their handmade counterparts – or if you’re a fan of hybrid scrapbooking – you’re generally much better off looking for software designed specifically for scrapbooking rather than using a tool like Photoshop or PaintShop Pro. That doesn’t mean you can’t create digital scrapbooks with those more general applications – it’s just a whole lot harder and more time-consuming. My Memories Suite is one of the top names in the digital scrapbooking software market, and a new version of the program has recently been released. Is it worth checking out? At the very least, I recommend downloading the free trial of the product and giving it a test drive, especially if you scrapbook on a regular basis. Let’s take a look at some of the program’s features and capabilities. One of the things that sets My Memories apart from other digital scrapbooking products is its ability to handle multiple types of media. You’re not just limited to inserting photographs and importing image files; you can also add videos or audio tracks, record your own narration and link to web pages or other files. These capabilities are extremely nice for creating a complete storytelling effect, but it probably will take a bit of practice and patience to learn how to use them well. That is, while you can insert audio files to play in the background while people are viewing your finished creation, videos and web pages are added as “hot spot links” and require the viewer to click on the link to see the media. In terms of overall ease of use, My Memories gets high marks. The software comes bundled with over 1,500 papers, 1,000+ embellishments and more than 30 album templates so beginners can jump right in and start using inserting their photos into pre-designed layouts. On the other hand, My Memories also sports a wide array of advanced tools for those who want to design their layouts from scratch – but these tools are quite intuitive and can be learned on-the-go. For instance, I’m a big fan of the Word Art tool for creating captions, photo quotes and other text-based elements. As a matter of fact, since you export single pages in PNG or JPG format, you may find yourself using My Memories for a lot more than just creating digital scrapbooks. Like most digital scrapbooking programs, the base price for My Memories Suite is very reasonable at $39.97, and an upgrade is available for $19.97 if you have a prior version of the software. However, you could end up spending quite a bit more than that if you go on a shopping spree on the My Memories site and fill your shopping cart with a lot of additional kits. 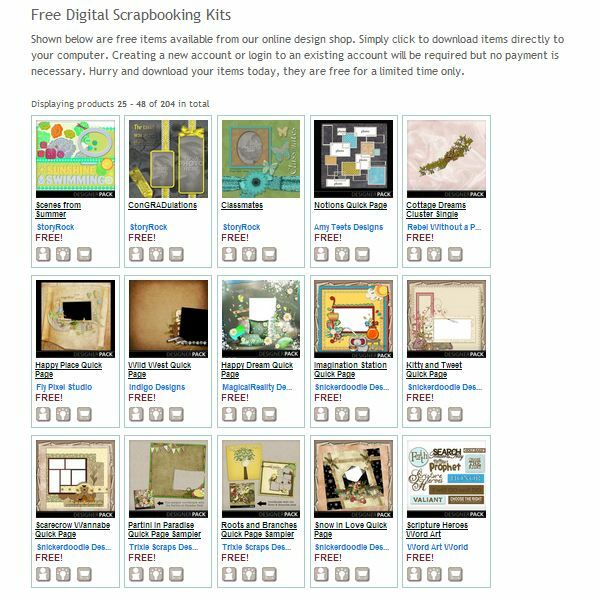 Before you start thinking about taking out a second mortgage to support your addiction to scrapbooking kits, be sure to check out all the freebies offered by My Memories – there are more than enough to keep most people busy for a long, long time. Even if you don’t decide to purchase My Memories, you may still want to bookmark the Free Kits page since many of the kit elements can be downloaded in PNG or JPG format and used with any image editing application. I’ve already mentioned that you can export an entire scrapbook or individual pages as PNG or JPG images, but that’s just the tip of the iceberg. You can also create a PDF of your scrapbook or, if you prefer more action-oriented output, you can turn your creation into an interactive slideshow or movie. If you want to go the movie route, you’ll need to download an additional media export plugin, but this is free for registered users of My Memories. Of course, you can also print your scrapbook on your home printer, but the software also makes it easy to have your final design professionally printed in the form of a photo book or calendar. There is an additional charge for the photo book and calendar options with the price depending on the number of pages in your project and other options you choose. If you’re an avid digital scrapbooker, My Memories Suite deserves more than just a passing glance – especially since a free trial is available. It’s particularly nice for beginners who are looking for a program that will grow with them as they become more proficient and want to design their own more complex layouts from scratch. And, it definitely doesn’t hurt that there are tons of free kits and design packs that users can download to increase their creative options. Have you tried out My Memories Suite yet? If so, what were your impressions? Are there any areas where you feel the software is lacking or do you think it’s the best in its class?